Light boxes are a fun new way to light up your space at home or at work! 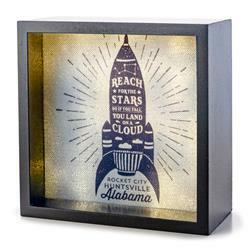 Unique and sturdy, this LED back-lit cube uses 2 AAA batteries , eliminating cords and freeing up your decorating options! Light box measures 6" x 6".